Much of the grain being used by feedlots in southern Queensland has been coming from WA via the Port of Brisbane. DOMESTIC grain prices have paid no attention to international pricing this week, and have firmed while growers in Victoria, New South Wales and Queensland wait for more rain to ensure a timely and full-scale plant of their winter crop. In southern Queensland, sorghum delivered Downs is trading at $345-$350 per tonne, similar to last week, while the NSW Liverpool Plains market is trading at $370-$380/t to reflect the limited supply of grain from its recently finished harvest. Liverpool Plains-based Agracom trader Brett Donoghue said the market has shown no softness in the past week. “If anything, new-crop wheat is a tad stronger,” Mr Donoghue said. Traders have quoted it as trading in limited quantity delivered Downs at up to $360/t, with barley around $330/t. Provided further rains fall to allow a timely and general planting of this year’s winter crop, Mr Donoghue said the trade was expecting growers to make a large-scale swing out of canola and pulses into cereals. Some sorghum from the Queensland-New South Wales border region, and even as far north as the Darling Downs, has continued to be being trucked to feedmills as far south as Berrima, between Canberra and Sydney. Wheat being sourced in the Riverina is coming by train and truck from South Australia, and also from Western Australia through ships coming into Port Kembla. Road and rail freight has continued to supply wheat and feed barley to flourmillers and feed mills. “The domestic market is still very strong, and what’s kept the lid on its upside is grain coming in from WA and SA. “The east coast is still the most lucrative home for that grain. At Goondiwindi, Goldstar Commodities broker Geoff Webb said new-crop wheat bids were starting to appear at around $360/t delivered Downs, but did not reflect the uncertainty of the season. “Most people still need a decent fall of rain to get going, and new-crop prices don’t reflect the fact that most people still need 50 millimetres of rain to get planted,” Mr Webb said. Current-crop wheat is trading at $410/t delivered Downs, around $30/t over the delivered Melbourne wheat market, which in turn is $20 above the Melbourne barley market at $360/t. This reflects a narrowing of the Victorian wheat-barley spread by around $20/t in recent weeks, caused by a drop in wheat’s value in the past couple of months. 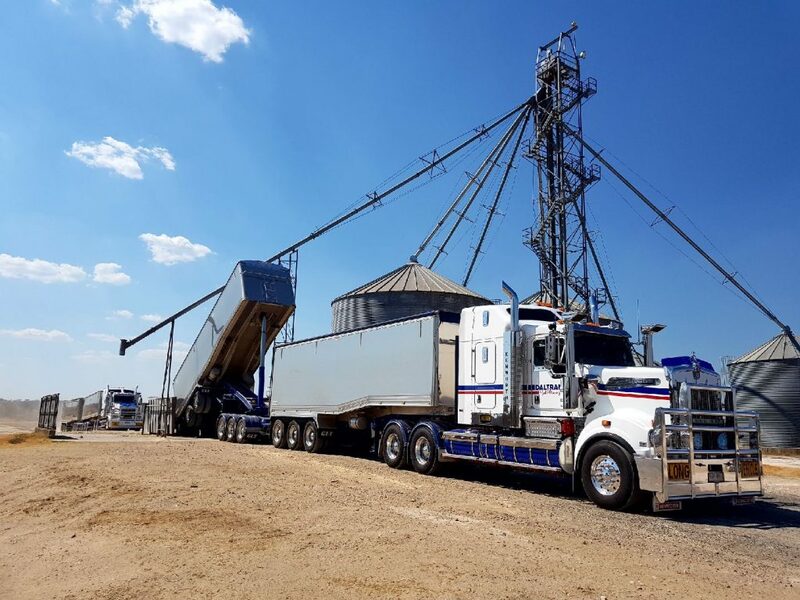 Riordan Grain Services trading manager Mark Lewis said Victorian farmers appeared to have sold much or all of their current-crop grain, and prompt prices appeared to be flat to slightly weaker. “Buyers seem to have gotten the cover they want for now, Victoria hasn’t got its opening rains yet, and the trade is executing a lot of South and Western Australian grain into the market,” Mr Lewis said. “The Victorian cash market is very illiquid, and there’s not of lot of bids,” Mr Lewis said. In parts of South and Western Australia, the usual practice of dry sowing ahead of rain is well under way, while in eastern states, growers have opened their seeding programs with forage or dual-purpose varieties of oats, wheat and canola. In NSW, planting on parts of the inner slopes and tablelands is advancing, while most growers in Queensland are still a week or two away from planting. Early gin start-up at some north-western NSW sites saw new-crop cottonseed moving both northward to Darling Downs and Condamine feedlots, and south to the MIA, where saleable old-crop stock has finally been exhausted by drought demand. “Seed is making its way south now from Gwydir Valley to the MIA, where gins are yet to start,” Woodside Commodities manager Hamish Steele-Park said. Spot prices were down hard again this week, while April/May onwards values appeared trimmed another $10-15/t. Traders said gins appeared to be planning to commence ginning a little later this year than last which meant the onset of new crop seed supply would be delayed. The later start date could be explained by the smaller crop, a function of limited affordable water, and the reduced number of weeks the gins will need to complete the task. Gin operations could also gain efficiency by waiting till after Easter and Anzac Day public holidays to provide an uninterrupted gin season. Trading in the eastern Australian wheat futures contract, ASX WM, more activity was seen in the new-crop (Jan 2020) contract than in the current crop (May 2019) in the first week of April. Nearby May 2019 contract settlement price was lower each day from April 3 at $375.50/t to April 10 at $355.80/t, having traded 55 lots on Monday at $375 and 115 lots on Tuesday from $373 to $364. Its settlement price fell $15.70/t. Open interest on April 3 was 1487 lots and on April 10 was 1447 lots. New-crop 2020 largely held its value over the same period. The January 2020 settlement price was $325.50/t on April 3 and $325/t on April 10. Open interest on April 3 was 7685 lots, and on April 10 was 7095 lots.